The Oakland Raiders returned home looking for their first win of the season as they hosted the Cleveland Browns and newly-named starter Baker Mayfield. 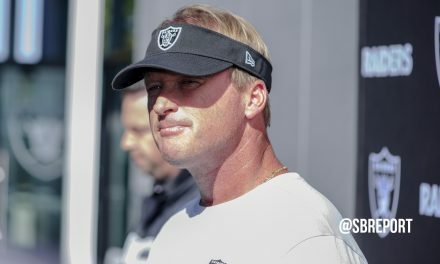 Jon Gruden and his defensive coordinator Paul Guenther have expected big things from second-year cornerback Gareon Conley and they got it on Sunday. Conley, who has played well this season, got the scoring started for the Raiders when he intercepted a pass from Mayfield and returned it 36 yards for the first-quarter touchdown to make it 7-to-0 early. Mayfield’s struggles would continue in the first quarter but the Raiders offense would be unable to take advantage of the slow start, going three-and-out on both of their opening drives. Cleveland’s rookie quarterback and the offense would find its rhythm in the second quarter with the help of rookie running back Nick Chubb who broke free and scampered 63 yards for the team’s first touchdown of the day. Mayfield would add on to the lead by finding his tight end Darren Fells over the middle, breaking free from a couple of defenders and walking into the end zone to take a 17-to-7 lead over the Raiders. Gruden’s team answered before the half as Derek Carr threw a fastball between two defenders into the arms of Amari Cooper to make the deficit just 17-to-14 at the half. The Raiders have struggled in the second half all season and it looked like it was going to be the same ol’ thing again on Sunday as the Browns extended their lead with 11-unanswered points to take a 28-to-14 lead in the third quarter. 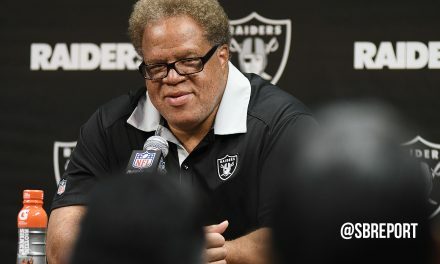 Rookie defensive lineman Maurice Hurst forced a fumble by Mayfield when the Raiders needed it the most, giving the Raiders their first possession this year starting in the opponents territory. 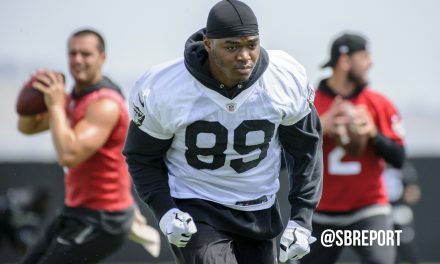 Carr and the offense took advantage finding his tight end Jared Cook who sat on the goal line and hauled in the seven-yard touchdown to make it 28-to-21. Following a Raiders field goal to inch them closer, Mayfield would turn the ball over for his third time after a botched snap with his center. Carr would take advantage of the short field once again by finding his veteran wide receiver Jordy Nelson to take the 31-to-28 lead. Raiders return man Dwayne Harris gave the Raiders an excellent opportunity to build on to their lead by breaking free on a punt return to go 49 yards and give the ball to Carr on the Browns’ 30-yard line. Unfortunately the Raiders would go three-and-out and have to settle for a field goal by Matt McCrane. McCrane made the 44-yard field goal from the dirt, where he missed from earlier, extending the lead to 34-to-28. But as he has done many times in college at the University of Oklahoma, Mayfield wasn’t going to quit. The rookie quarterback found his speedster wide receiver Antonio Callaway across the middle who broke free for a 59-yard reception before being pushed out of bounds at the one-yard line. Browns running back Carlos Hyde would punch it in, giving the Browns the 35-to-24 lead. Hue Jackson’s team wasn’t done scoring though as the head coach went back to his rookie running back Chubb. Chubb took his third carry of the day 41 yards up the middle of the field for his second touchdown of the game. The former Georgia Bulldog carried the ball just three times but had 105 yards and two touchdowns. Down 42-to-34 with just over four minutes left in the game, it was Carr’s turn to try and answer. The veteran quarterback found Martavis Bryant and Cooper on the way to getting to the Browns six-yard line. But from there, the Raiders offense would go backwards. A pass to Bryant would lose three yards and then facing a 4th and 8, Carr and Cooper couldn’t get on the same page the ball fell incomplete in the end zone to turn the ball over on downs. Gruden’s team still had three timeouts and a chance to get the ball back and stopped Hyde just short of the first down. Carr had one final chance, getting the ball back with 1:28 left in the game and no timeouts. 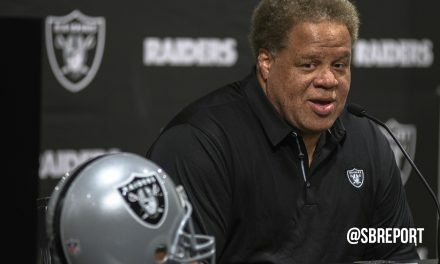 Starting on his own 47-yard line, Carr took what the defense gave him with two passes underneath before taking a deep shot to Nelson as Seth Roberts drew a defensive-holding penalty. Running back Jalen Richard had what looked like would be a costly false start penalty, but came back on the next play and used a nice move on an underneath catch to scamper 18 yards and get out of bounds to stop the clock. Carr found Cook in the end zone on the next play, but the Raiders still needed a two-point conversion to tie it up. Carr found Nelson on a fade route to make it 42-to-42 with just 30 second left in the game. Mayfield had one last chance to win it in regulation but safety Reggie Nelson stepped in front of a pass deep to intercept the ball, forcing an overtime. Carr and the Raiders won the coin toss, receiving the ball first in overtime. Carr took advantage by finding Cooper for a 36-yard gain to get into Browns territory. Unfortunately, Carr would take a costly sack on third down that would force a 50-yard kick off the dirt for their rookie kicker. Mayfield tried testing Raiders cornerback Rashaan Melvin deep on the ensuing drive but Melvin calmly reached up to knock the ball away from running back Duke Johnson, Jr. to force a Browns punt. Carr stood in the pocket strong on 3rd and 3, taking a hit to the ribs but found Cook down the left sideline for a big 24 yard gain. Gruden would lean on Lynch heavily from there, getting the ball into position for a game-winning field goal. This time, the Raiders rookie kicker McCrane nailed 29-yard field goal to give Gruden his first win of the year, 45-to-42. Gruden and the Raiders will head to Los Angeles next week to take on the Chargers who are coming off of a win against the San Francisco 49ers.